Speaking of trends, then I want you to have a look at this amazing compilation of women's ripped jeans that are in style this 2018 year. I love these bottoms for their sharp and sophisticated look. It seems like this is already a timeless piece that will never go out of fashion. No matter how big holes are they are always available and people buy them no matter what's the season outside. They are extremely versatile, though you can not appear with them at the office or any other formal event. But you can always try them on with different sporty combos for making an statement urban look. 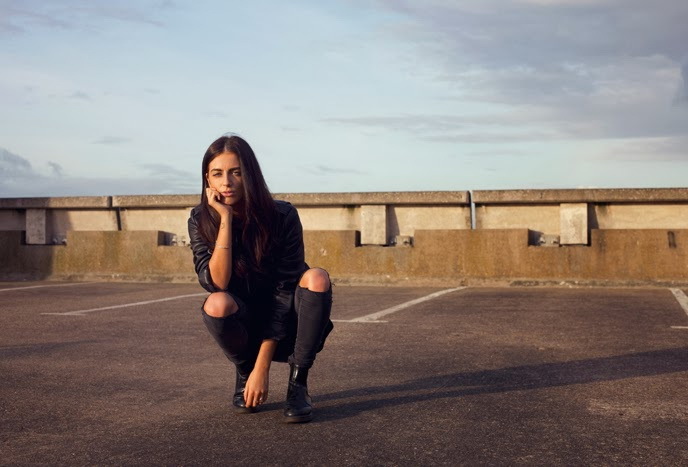 That's an awesome look that features a girl who appears in the street wearing lace, black crop top styled with ripped skinnies that are paired with tartan slip-ons and cool black colored leather bag. No matter if you try on boyfriends, skinnies, mom, cuffed or cropped styles they will always make you look individual and trendy. You are going to see cool and effortlessly chic styles that are perfect for making a sophisticated outfit. Hope you will find the perfect model to try on this year. If you want yourself a right amount of preppy touch, Tomboy style and girlishness, then I recommend you to have a look at this stunning outfit that features a wide-brim hat, white dotted turquoise shirt tucked in ripped, slim-fit denim pants that are paired with muted orange heels and cool satchel bag. This outfit reminds me of Michael Jackson style. Lady appears all in black: leather jacket, skinnies and cool runners in white and red color. You can update your look by wearing awesome skinnies with casual white tee and leopard jacket. I love the black glossy pumps, quilted bag and timeless sunglasses. How about combining Tomboy with Dandy look? Here we see model who appears in the streets wearing white wide brim hat, black leather jacket, crispy white top tucked in regular white jeans. 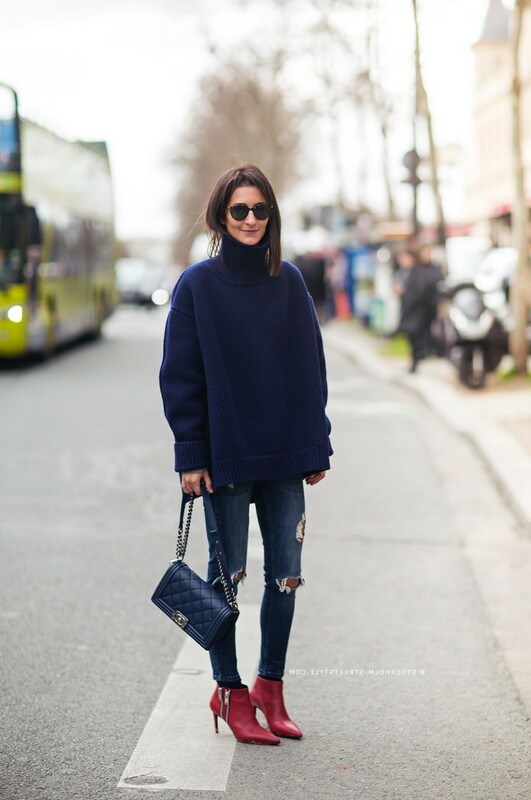 The cocoon shaped dark blue bulky turtleneck sweater looks awesome with dark blue slim-fit jeans, red leather pointed-toe booties and cool tortoise rounded sunglasses. Speaking of functionality, then I recommend to try on simple looks. Here we see a perfect outfit that features white shirt tucked in extremely ripped and distressed light blue denim pants that are paired with animal print heels. Love the mirrored sunglasses. Here we see a Dandy look: wide-brim fedora, pale purple colored coat, white pullover and ripped knee skinnies. There is kind of hipster inspired touch in this look. 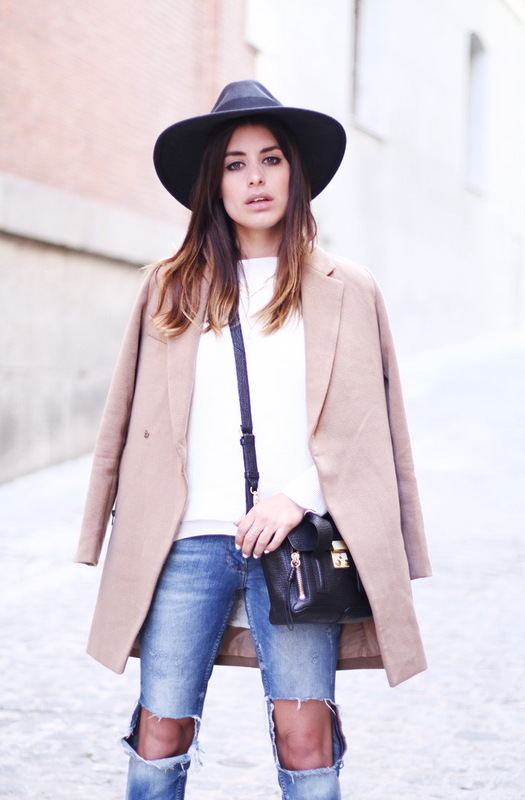 We see a boxy coat worn atop light grey turtleneck and styled with cool bottoms. How about a boxy fit look? We see a grey colored coat worn atop bulky, cable knit tunic sweater and slim bottoms paired with black booties.